After a strong, ambitious programme in 2013, which proved that there is still very much life in the 60-year-old festival, this year the Berlinale felt like a step back. But while the Competition line-up in particular left much to be desired, the festival on the whole included attractive events (including special screenings of Snowpiercer and Nymphomaniac) and terrific guests such as Nick Cave and Lars von Trier, all radiating an unflinching sense of excitement about the of future editions. One of the most enjoyable entries in Competition was Ning Hao’s No Man’s Land. A nihilistic neo-Western road movie comedy thriller, the film was originally shot in 2009, but then held by censorship authorities and rescheduled several times over the past few years because of its allegedly negative portrayal of the police. After at least three official resubmissions and endless editing and re-cutting, the version of the film presented here was the one that had finally been released theatrically in China in 2013. Yet, it came as a welcome surprise that, except for its newly attached, and effectively arbitrary ending, Ning Hao’s wildly cynical (and frequently bonkers) fable remains tightly paced and eminently fun to watch, if nothing more substantial. Scratching a little deeper beneath the surface of China’s social malaise, it was bizarre frozen noir Black Coal, Thin Ice by fellow countryman Diao Yinan that was deemed worthy of the Golden Bear for Best Film. And, much to everyone’s surprise, the jury also honoured its star, Liao Fan, with the Best Actor award. The story begins in 1999 in northern China, where Zhang (Liao Fan), a washed-up, recently divorced cop, is tasked with investigating a murder case after some body parts were discovered in a number of coal shipments in the area. But rather than solving the mystery, Zhang eventually loses his place on the force until, five years later, a chance encounter with an old colleague leads him to become entangled with the case again. With nothing else in his life to cling to, he quickly becomes obsessed, both with the investigation, and with the widow (Gwei Lun Mei) around whom it all seems to revolve. What becomes clear in the course of increasingly irritating events is that, while a truly extraordinary visual experience, Black Coal, Thin Ice can’t disguise the conventional heart that beats at the centre of the narrative. Still, in the context of a fiercely underwhelming Competition, it did make the film engaging and puzzling enough to stand out from the rest. A similar plot problem prevented Hans Petter Moland’s In Order of Disappearance from being anything more than average, fun crime fare. Convincing embodying a man whose resolve is sorely tested, Stellan Skarsgård plays Nils, a reputable snowplough driver by profession, more at ease with action than words – especially if he is upset, or angry, or both. Devastated when his son suddenly dies of a heroin overdose, he decides to take revenge. Although the filmmaking is assured and the pace correspondingly brisk, keeping in line with its hero’s spirit, there is no denying that Moland also reworks an all too well-tested formula here, which places his playful slice of Nordic noir at risk of running idle. It was Andreas Prochaska’s rare Austrian Western The Dark Valley, presented out of competition as part of the Berlinale Special strand, which turned out to be one of the most debated revenge chillers of the festival. A former editor for Michael Haneke, Prochaska first gained credit as a director with slash horror flick Dead in Three Days (In 3 Tagen bist du tot, 2006), but The Dark Valley is a different kind of beast entirely. Based on the 2010 bestseller by Thomas Willmann, the film is set in a distant higher region of the Tyrol Alps in the 19th century. 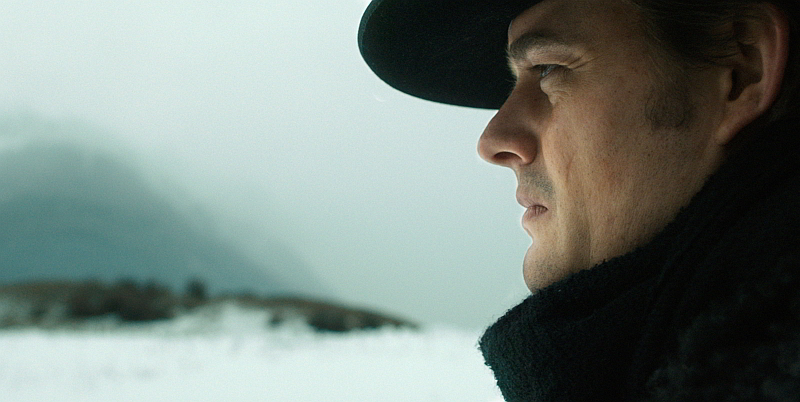 Grim-faced Greider (Sam Riley), a storybook-style lonesome horseman, arrives in a remote village just as winter sets in, isolating the place from the rest of the world. Introducing himself as a photographer intending to capture the impressive landscape and its inhabitants, the mysterious, quiet American is greeted with distrust but eventually finds shelter with Luzi (Paula Beer), the narrator of the story, and her widowed mother. It comes as no surprise that Greider’s true intent is nothing less than vengeance, in this case against old Brenner (Hans-Michael Rehberg), an uncompromising patriarch who has ruled over the women in the village for decades by claiming droit du seigneur over any newlywed brides, including Grider’s beloved mother. It’s not long before blood is shed and once the cards are on the table, things move slowly towards a final showdown. While the film has been widely criticised for its clumsy storytelling, flat, cliché-ridden characterisation and uncompromising, grim stolidity, its advocates suggest that The Dark Valley is well worth a second look as it stumbles into that small canon of films that dare to relocate the tropes and texture of the Western genre to some bleaker bolder, more eccentric climes. There is no denying that, aesthetically and conceptually, Prochaska aims high here, but while he dazzles on the former level, he is not as successful on the latter. Still, you have to admire Riley for keeping a perfectly straight face throughout his fierce revenge frenzy, while Prochaska and his cinematographer Thomas W. Kiennast make excellent use of the snowy landscape that serves as an appropriate setting for a staggering war of retaliation. One of the true standouts this year was Iain Forsyth and Jane Pollard’s intriguing and vastly inspiring Nick Cave portrait 20,000 Days on Earth. Following on from the short films they made to accompany the albums of Nick Cave and the Bad Seeds, the artist-filmmaker duo have created a beguiling, artistic and spirited look at the life and work of a man who, celebrated as a musician, songwriter, author, screenwriter, composer and occasional film actor, never seems to rest. Through a vivid collection of memories, archive materials and conversations with those who have affected and inspired him, both professionally and personally, the film explores Cave’s very personal views on the world in general, and his everyday life and creative process in particular. If there was one thing to take away from the film, and perhaps the festival on the whole, it was that dazzling feeling of awakening and the incentive to work hard for your passion and dreams – to suffer the pains and savour the victories.